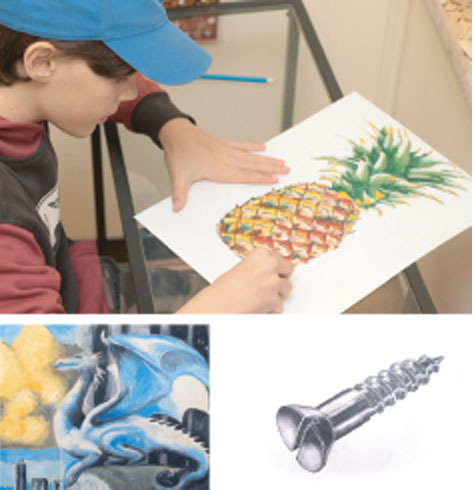 Clement Art Comprehensive Intermediate Level duration is two to three years, This consists of still life, landscape, portrait drawing and illustration skills. Various introductions to painting and drawing materials such as pencil., charcoal, coloured pencil, watercolour, oil pastel, soft pastel, acrylic, poster paint and usage of most kinds of craft materials. Student will concentrate on different themes along with the use of various media. This will enable them to grasp the application of techniques and materials as it is appropriate to the subject matter. They will gain a comprehensive understanding of materials and process to broaden their visual art horizons.